Dock Icons is a lightweight utility that allows you to preview app icons in the OS X Dock quickly. 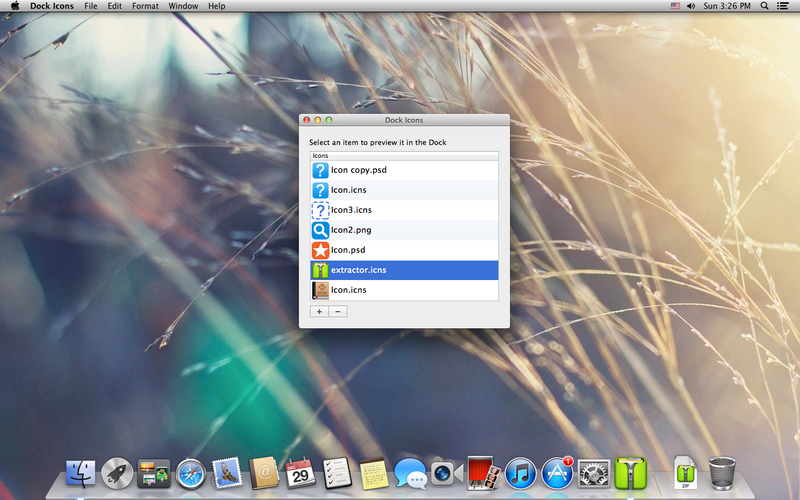 Simply drag an image into Dock Icons and see what it exactly looks like in the Dock! Whether you are a designer or a developer, Dock Icons saves your time. As a designer, you don’t have to scale your icon and paste it into a screen shot in order to get an idea what it roughly looks like in the Dock. As a developer, you don’t have to create an .icns file and replace the one in your app bundle and restart your app in order to see the result. You can create several icons, drag them into Dock Icons and use you arrow keys to navigate through them and see the slightest deferences between them! By comparing your icons, you will find out the best one easily. Dock Icons support the most commonly used image file types, including .psd, .ai, .png, .tiff, .gif, .jpg and many other file types.